SQL DELETE query is used to remove a single row, some rows or all from a table. 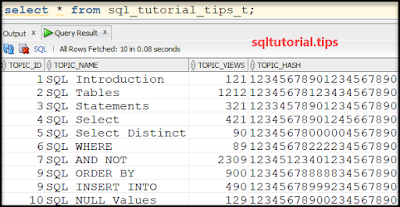 In this SQL Tutorial, we will see the DELETE syntax, examples in details. Please note that we need to issue COMMIT command to make the changes permanent. Here, In the above SQL where <condition> can be any boolean expression. It decides whether the delete command will affect a single row or more than one rows. All the rows satisfying the condition get affected y the query. We need a table with 10 rows to explain how delete works. 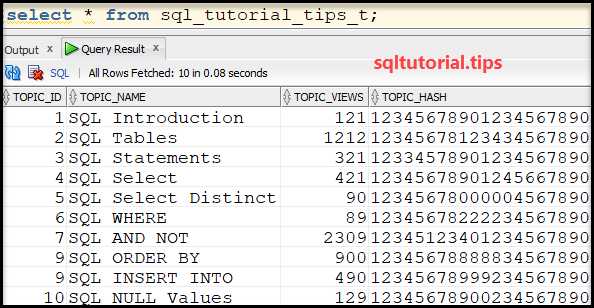 We will create a sql_tutorial_tips_t as a demo table. Let us say there are four columns in that table. Those are showed below. Now let us insert some rows into the table using SQL INSERT Statements. Now as we issued INSERT DML command, we need to execute COMMIT to make the changes permanent. Let us understand delete examples now. The table looks like the following. This SQL delete example will only delete some rows in the table. Here are the two rows which got deleted. What if we want to delete all the rows of the table! We will see that in the next section. Note: It is always a good idea to write the SQL SELECT Query first and then use that where clause in the delete statement just like we did in SQL UPDATE section. We need to write the delete statement without a where clause (or write the where clause in such a way that it selects all the rows). The later makes no sense as omitting where clause means selecting all the rows of that table only for processing. In this SQL Tutorial, we learned about delete syntax, how to delete a row from a table or how to delete multiple rows from the table. Please share your valuable feedback below.